Pick up some ethical skin care deals below. Receive a free Selection Box worth £55 when you spend £60 or more at LoveLula using the coupon code below. Award winning LoveLula offer natural and organic beauty products from more than 200 brands. Save 20% at Bloomtown Botanicals using the discount code below. Bloomtown Botanicals are home to 100% palm oil-free and truly cruelty-free eco-luxuries for bath, body and home. Take 10% off your first order at Ethical Apothecary using the coupon code below. Ethical Apothecary is a clean and wellbeing lifestyle boutique, representing ethical beauty at its core. They are truly passionate about all things health and wellness. 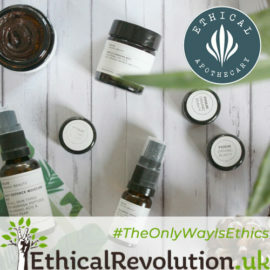 Ethical Apothecary’s collection of products is a stunning collaboration of award-winning, handcrafted, professional brands that they firmly believe in, know and trust. Take a 15% discount on your first subscription box from Green Eco Box using the promo code below. Green Eco Box carefully select gourmet and natural cosmetic products made by artisans from different countries within UK and Europe that are good for you and good for the planet. For each purchase received by Green Eco Box they plant a tree as well as making a donation to WWF or Greenpeace. Take 15% off all Heavenly Organics products (excluding gift sets/vouchers and multi save packs) when you spend £10 using the coupon code below. Heavenly Organics are a multi-award winning, organic, natural, vegan & handmade UK skincare brand who use no palm oil. Take a 15% discount on all orders at The Ethical Giftbox, exclusive to Ethical Revolution followers, using the discount code below. The Ethical Giftbox curate ethically sourced, environmentally friendly pre-made gift boxes. You can also build your own gift box from their range of thoughtfully tailored Fair Trade, recycled, British-made, vegan and sustainable gifts. Plus receive free delivery on all orders over £35. Take 10% off any order from Boho Dust using the discount code below. I’m really excited about this one. I love glitter, but it’s so damaging environmentally. Enter Boho Dust: biodegradable glitter that’s safe for skin and kind to mother nature. Receive 10% off your first order at Wearth by signing up to their newsletter. using the voucher code below. Wearth is an eco-friendly and ethical department store who stock independent UK brands that take the environment seriously. From plastic-free & cruelty-free skincare to reclaimed, handmade furniture, Wearth make it easier to shop consciously online. Take 5% off all items at Gift Direct using the promo code below. Gift Direct sell ethically-produced gifts that are not easy to find in the high street: from beauty products to home furnishing, garden and pet care. Receive 10% off at ethical department store Danu World using the promotional code below. Use this Danu World coupon on their faitrade, eco friendly and ethical home, beauty, gift and outdoor ranges to help inspire you to be the change. Receive 15% off any purchase of Earth Conscious Natural Deodorant using the discount code below. Plus get free postage on all orders over £25. Earth Conscious is an effective 100% Natural Deodorant that includes a vegan range. Check out my review of Earth Conscious here. Receive a 20% discount on orders over £50 at Totally Organic using the coupon code below. Totally Organic are an independently-run natural beauty, hair and skincare company whose products are certified organic, cruelty-free & either vegan or vegetarian. You must register an account and be logged in for this coupon to work and it is not valid on sale items. You’ll qualify for standard free delivery with the order being over £25. Nature’s Healthbox have set up a 15% voucher code for followers of Ethical Revolution. On a mission to bring you the best natural, organic and eco-friendly products, Nature’s healthbox offer a range of natural health, beauty and home products for men, women and children. Save 15% on your first order from Conscious Skincare using the coupon code below. Conscious Skincare make organic, 100% chemical-free, cruelty-free, natural skincare products using ethically sourced, plant-derived ingredients. All packaging is recyclable. Receive 10% off your first order at Babipur* using the coupon code below. Ethical shopping for kids 0-6 years, specialising in ethically sourced toys, organic clothes, cloth nappies, slings, eco sanitary pads and more. *Does not apply to sale items. Babipur only source ethically produced goods: Everything is ethically made using natural & sustainable materials and fair trade practices free from harmful chemicals. Get £10 off any purchase at Mama Nature using the coupon code below. Mama Nature lead the way in the use of natural and organic ingredients in skincare. Their natural products are made to avoid harm to you, animals and our environment. Save 10% on any order at Vitalife Health by simply clicking the offer button below. Start adding items to your cart and the 10% discount will be automatically added site-wide. Vitalife stock 100% natural health products – Strictly no highly-processed or artificial ingredients in their products: only simple, pure, natural goodness. The Ethical Shop by New Internationalist is a great place to get eco-friendly gifts, fair trade presents and organic treats. Shop ethically at ethicalshop.org and enjoy a 10% discount using the coupon code below! 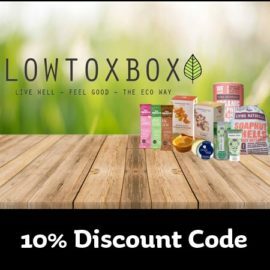 LOWTOXBOX is a healthy, eco-friendly, monthly lifestyle subscription box full of handpicked products to help you live a greener, healthier, eco-conscious life. Use the coupon code below at checkout to receive a 10% discount on your first ‘Month by Month’ box. Keep Fit for Discounts on Healthy Goods! Earthmiles reward you for adopting a more active lifestyle. Simply download the app and earn earthmiles the more you keep active. Earthmiles can then be spent as discount vouchers on a wide range of nutrition, fitness and wellness products. Love Health Hate Waste are now dropping their standard shipping fee of £6.99 for orders over £30, for ever! That’s free shipping on all orders over £30. With already up to 90% off food & drink, health & beauty and household items, there are some amazing savings to be had. The Pip Box offer a cruelty-free beauty gift box subscription service. Sign up using the gift code coupon below to receive 10% off your first box when using the Month to Month plan. Living Naturally create plant-based laundry, haircare & skincare products that are handmade in the UK from 100% natural, vegan, organic, sustainable, ethical & cruelty free ingredients. -Free from SLS, parabens and mineral oil. Use the discount code below to get 15% off all orders from Living Naturally. 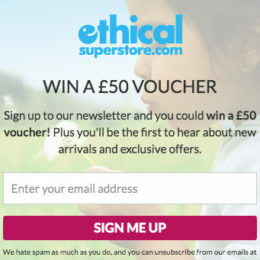 Four prizes of £50 worth of Ethical Superstore vouchers are drawn every 6 months. By signing up to their newsletter you are automatically entered into the prize draw. The newsletter sign up form is found at the base of their website. Love Health Hate Waste Products – Save 90%! Save up to 90% at Love Health Hate Waste. Love Health Hate Waste stock health products that are either past their Best Before Date or in damaged packaging but still fine to consume. Choose a Love Health Hate Waste subscription box and receive a box full of reduced health products (every month or every fortnight) with savings of at least 67%! You can choose boxes for £10 (goods worth £30) / £25 (worth £75) / £50 (worth £150) / £100 (worth £300). Bargain hunting has never been so easy! For every two products you purchase from Mama Nature you will receive a free eye cream worth £34.95. Receive a £5 Mama Nature gift voucher towards your first purchase of natural skin care products. Simply enter your email at the pop up when you first visit the site to receive your gift voucher by email. Eighteen Rabbit curate fair trade apparel and interiors made by artisans around the world. Get 10% off your first order by signing up to their newsletter. A coupon code will then be emailed to you. All UK orders include free postage. Each week The Natural Store take different items and reduce their price. These can be found in the Natural Store’s extensive reductions section and includes ethical fashion, household items and pet food. Get up to 50% off a huge range of fitness and fashion items at Fushi: Ethical Wellbeing, Beauty & Fitness. All Fushi products are 100% natural, ethical and suitable for vegetarians. Find up to 50% off in Big Green Smile’s vast special offers section. Big Green Smile stock natural beauty and skincare products, body & bath, hair care; organic baby and natural cleaning products. All you need for your organic lifestyle. Planet Organic are a superb online organic shop stocking everything from organic groceries to cleaning products, skin care, pet food, books, gifts and more. If you are aware of an offer that should be listed please do let me know about it here. Subscribe to the RSS feed to get the latest deals in this section as soon as they arrive.Subscribe to the RSS feed to get the latest deals in this section as soon as they arrive. Some of the links above are what’s known as affiliate links. Please see the penultimate paragraph on my about page to learn more.